Fomites: Possible vehicle of nosocomial infections. Citation: Olise CC, Simon-Oke IA, et al. Fomites: Possible vehicle of nosocomial infections. J pub health catalog. 2018;1(1):16-16. Nosocomial infections (NI) are infections contracted during the cause of hospital treatments, which are secondary to the patients’ original condition. A retrospective survey of nosocomial infection rates was carried out, using patients’ medical files and diagnosis index. Surfaces of non-invasive fomites which frequently come in contact with patients were swabbed; drip stands, door knobs, fan switches, bed rails, bed linens, pillow cases, light-plug-ins, and sink knobs for microbial contamination. Microbes isolated from the 225 swabs samples were identified using standard microbiological methods. An overall prevalence of 11.9% nosocomial infections was recorded. The Intensive Care Unit (37.5%) and Children ward (7.6%) recorded the highest and lowest prevalence respectively. Prevalence of nosocomial infections in the sampled wards was significantly different at (P>0.05). Door knobs (22.76%) recorded the highest microbial contamination; while light-plug-ins (4.88%) and pillow case (4.88%) were the least contaminated fomites. The highest bacterial colony count of 9.6 × 106 cfu/ml which is higher than the infectious dose of 106 cfu/ml was recorded on the door knob of Female surgical ward while pillow case shows insignificant count across most wards. Surface contamination of fomites within healthcare setting is significant issue of concern in public health thus the need to implement strict policy to reduce the rate of surface bio-contamination of hospital environment. Inanimate objects which become contaminated by microorganisms and serve as route of transmissions of such organisms are called fomites. Most infections outbreak associated with inanimate objects are as a result of items that should be sterile, but have been contaminated by pathogens . Fomites, when in constant contact with humans or natural habitats of pathogenic organisms constitute a major source for the spread of infectious diseases . The outbreak of community acquired infections and nosocomial infections have been found to be aided by surface bio-contamination of fomites . Healthcare workers’ (HCW) hands seem to be the most common vector of nosocomial infections, although food served within healthcare facilities, as well as medical equipment and instruments (fomites) have also been implicated . Fomites play significant role in the transmission of many diseases, but the extent to which formitic reservoirs contribute to the overall rate of nosocomial or environmental infections is unknown. Surface colonization of various inanimate objects in a hospital setting by microorganism has been reported as a potential vehicle for the transmission of nosocomial pathogens . In Nigeria where the health sector is inadequately founded and proactive programmes are not in place one will believed that cross infection rate will be higher between patients and the inanimate environment. Data on prevalence of Nosocomial infection and rate of microbial colonization of inanimate hospital surfaces is scanty and there is no documentation of the situation in Akure, particularly the State Specialist Hospital, it therefore becomes imperative to establish base line information on the prevalence of nosocomial infections and rate of bio-surface contamination of fomites in the hospital. This study thus aims to accomplish a retrospective study on Nosocomial infection in the State Specialist Hospital Akure. The State Specialist Hospital is located in Akure, Ondo state, Southwest Nigeria. Akure the state capital lies between 7°15’N, 5°11’42°E, with a temperature range of 24-28°C and relative humidity of 80%. The State Specialist Hospital, Akure is made up of ten wards among which are Critical Care Unit, Accident and Emergency, Male and Female surgical wards among others. A letter of ethical consideration was collected from the Chief Medical Director who is the chairman of the ethical committee of the hospital, for sample and patients data collections from January to December 2015. A retrospective survey of nosocomial infection rates was carried out, using patients’ medical files and diagnosis index. Data of patients’ who spent more than 48 hours of hospital stay were collected for survey. The rate of nosocomial infection was calculated by dividing total number of patients infected by total number of patients discharged and expressed as a percentage. A total of 1500 patients’ records were investigated of which only 506 were in-patients during the period of this study. The in-patients records were the ones strictly used in this study. Male surgical ward (MSW), Female surgical ward (FSW), Critical Care Unit (CCU), Accident and Emergency (A&E), and Children ward (CH). Bed rail, Bed linen, Pillow case, Fan switch, Drip stand, Door knob, Chair, Sink knob, and Light-plug-ins. A total of 225 swab samples of bed railings, bed spreads, chair, fans switches, sink faucet, door knob, light-plug-ins, pillow, and drip stands, were collected aseptically. The samples were obtained by rubbing sterile cotton wool swabs already soaked in 8.5% physiological saline on these fomites. The swabs were then put into sterile test tubes, closed tightly, labelled and coded appropriately. All samples were then transported to the research laboratory of the Department of Biology, Federal University of Technology, Akure. Glass wares were washed with detergents, rinsed with tap water and oven dried at 160°C for 1 hour. Forceps and inoculating loops were flamed to red-hot with the aid of a Bunsen burner and then dipped in 70% ethanol. Culture media, beaker, conical flasks, and other materials were autoclaved at 121°C for 15 minutes. Incubators, inoculating and growth chamber were fumigated with 40% formaldehyde. Work benches were disinfected by cotton wool previously moistened with 70% ethanol. Nutrient agar, Eosin Methylene Blue, MacConkey and Sarbouraud agar were weighed according to the manufacturer specification and the agar were introduced into clean conical flask. Distilled water was added, and the flasks were plugged with foiled paper and cotton wool to prevent leakage, and the media was sterilized by autoclaving at 121°C for 1 hour. After sterilization, it was allowed to cool to about 45°C and poured into petri dishes aseptically and allowed to solidify. Swab stick was used to inoculate aseptically on the Petri dishes containing the different agar, by streaking the agar surfaces with the swab stick, and bacteria plates were incubated at 37°C for 24 hours, while fungi plates were incubated at 25°C for 5-7 days respectively according to the method described. At the termination of incubation period, the plates were examined for growth and the morphological appearance of the micro-organism on the agars used were observed, further biochemical tests; Gram staining, catalase, coagulase, indole, and oxidase test were carried out so as to identify the bacteria isolated. A heat fixed smear of 18-24 hours old culture was prepared on a clean microscope slide. The smear was stained with crystal violet for 30-60 seconds; after which the stain was rinsed off with distilled water under a running tap. Logol’s iodine, a mordant was added to intensify stain for 60 seconds and was rinsed off with distilled water. 95% ethanol was added to the slides as a decolourizer for 10-15 seconds and rinsed off under a running tap. Saffranin O’ a counter stain was added to the smear for 30 seconds, rinsed off with distilled water. The slide were allowed to air dry and then observed under × 100 oil immersion objective binocular microscope. For the motility test, culture broth was prepared. In preparation of culture broth, double strength of nutrient broth was prepared, it was allowed to settle and the broth was gently dispensed into the test tube, the test tubes were then sterilized and after sterilization the broth were allowed to cool and the bacteria was inoculated into the broth and incubated at 37°C for 24 hours. After incubation period, clean glass cavity slide and cover slip were used in which Vaseline was applied to all edges of the cover slip, this allows the adhesion of the cover slip to the cavity slide. The culture broth inside each test tube was shaken and inoculating loop was used to transfer two loopful of the culture broth into the cavity slide and covered with cover slip. The cavity slide was inverted quickly in order for the drop not to run off to one side and if it was examined under × 40 objective microscope. This test was done to differentiate the spore-formers from the non-spore formers using the Schoeffer-Fulton method. On a clean grease free slide, a smear of the isolate was made. It was later stained with 5% malachite green and heated over a beaker of boiling water for ten minutes. The stain was washed off with distilled water, 0.5% aqueous safranin was used to counter stain for 15 minutes. This was washed off with distilled water and allowed to dry, immersion oil was added before viewing with microscope. Bacterial spores stained green while vegetative cells stained red on microscopic examination. This test was done to identify Pseudomonas aeruginosa. The oxidase reagent was prepared by dissolving 0.1 g of tetramethyl-p-phenylenediamine in 10 ml of sterile distilled water. A fresh culture of the isolate to be tested was prepared. Clean Whatman No.2 filter paper was placed in Petri dish and three drops of the freshly prepared oxidase reagent added to it. The culture of the isolate was smeared across the impregnated paper with a platinum loop. A positive reaction was indicated by the appearance of a dark purple colour on the paper within 10 seconds. 2-3 ml of hydrogen peroxide solution was poured into test tube and sterile wooden stick is used to remove several colonies of the test organism and immerse in the hydrogen peroxide solution. Immediate production of bubbles indicates a positive result, while no production of bubbles indicates a negative result. A drop of distilled water was placed on each end of clean grease-free slide with the aid of sterile inoculating loop, a colony of the test organism was picked aseptically using sterile inoculating loop and the colony was emulsified on the drop of distilled water. An inoculating loop was used to add a loopful of plasma suspension and was checked for clumping of organisms. No plasma was added to the second suspension thus this is used to differentiate any granular appearance of the organism from true coagulase clumping. Clumping of the organism indicates a positive result, while no clumping indicates a negative result. These was performed by growing the isolates in 10 ml sterile Tryptone Water (Oxoid, Basingstoke, UK) for 24 hours at 37°C. Kovacs’ reagent (0.5 ml) was then added to the culture using a pipette. The test tube was shaken and examined after one minute. The presence of Indole was detected by the appearance of a red layer in the medium while its absence was denoted by a yellow layer. Two sets of slants of Simmons citrate agar were prepared in bijou bottles, with the aid of sterile straight wire normal saline suspension of the test organisms were streaked on the slants and were incubated at 37°C for 48 hours. A bright blue colour on the agar slants in the tubes inoculated which indicated positive result. Some microorganisms have the ability to metabolise varieties of sugar as carbon source produced by the organisms. Fermentation occurs when carbohydrate are used in the total or partial absence of oxygen. Glucose, sucrose, lactose, maltose and mannitol were used for this fermentation test. 1 g of each sugar was weighed into different conical flasks and labelled accordingly. Into each flask, 1 g of peptone was added and made up to 100 ml with distilled water. 0.1 g of NaCl was added as physiological saline, 0.01 g of phenol red was added as indicator and 5 ml each of the sugar solution was dispensed into different tubes with Durham’s tube inverted into each test tube. The mouths of the tubes were plugged with cotton wool and labelled appropriately; it was then sterilized in an autoclave for 15 minutes at 121°C. The tubes were then allowed to cool down. The bacterial isolates were inoculated aseptically into the sugar solutions in the tubes and incubated at 37°C for 72 hours. The change of colour from red to yellow indicates acid production which implies the utilization of the sugar by the microorganism and appearance of bubble in the Durham’s tube indicates gas production but if otherwise, acid or gas is not produced. A little of the culture of the test bacteria was streaked over the surface of the agar slant of urease test medium with phenol red as indicator and incubated at 37°C for 7 days. A control of the basal medium containing no added urea was equally inoculated. A colour change of the medium from yellow to pink or red was an indication of a positive result and no colour change indicate a negative result. This was carried out through morphological appearance and staining. Using a pasture pipette two drop of Cotton-Blue-in- Lactophenol was placed on a clean slide; the mycelium of the isolate was collected aseptically using sterile inoculating needle and teased out on the slide carefully. A cover slip was rightly placed on it and then viewed under the microscope. From the agars, each distinct colony were sub-cultured using sterile inoculating loop previously flamed to red-hot and cooled to pick the colony from all the isolation plates and then streaked on nutrient agar for bacteria and Sabouraud agar for fungi. This inoculated medium was incubated at 37°C for 24 hours for bacteria and 25°C for 72 hours for fungi. Total viable count was done as per the guidelines of American Public Health Association (1992) using pour plate method. Swab samples were initially soaked properly in 1 ml of 0.1% peptone water and after that to get 1:10 dilution, 9 ml of 0.1% peptone water were mixed properly. Thereafter, 10 fold serial dilutions were made up to 6th dilution. 1 ml each from the 105 dilutions was inoculated in the pre-sterilized Petri plate and replicated in triplicate for each isolates. About 15 ml of sterilized nutrient agar maintained at about 45 ± 1°C was then poured in each Petri plate and were mixed uniformly and allowed to solidify. The plates were incubated at 37°C for 24 hours. Average count of the colonies between 30 to 300 in 105 dilutions was multiplied by the dilution factor to get the total viable bacterial count of the sample. Data obtained were subjected to statistical analyses using SPSS (Statistical Package for Social Science) version 21.0. Analysis of variance (ANOVA) was use to separate the mean microbial isolates from the sampled fomites using new Duncan multiple range test. Chi-square analysis was done to test for significant in infections rate in the sampled wards. The prevalence rate of 11.86% was recorded in all the five wards (Table 1). The Critical Care Unit recorded an infection rate of 37.5%, 14.3% was recorded in the Accident and Emergency wards, 10.9%, 12.3% and 7.5% infection rate were recorded at the Male Surgical ward, Female Surgical ward and Children ward respectively. Statistical analyses showed that there is no significant different in infection rates across the wards at (P>0.05). Table 2 shows a positive relationship between infection rates and microbial isolates in the sampled wards with Pearson’s’ correlation values of 0.82 and 0.64 at P<0.05. Table 1: Prevalence of nosocomial infections in the sampled wards of the study area. Table 2 shows that 28 (26.92%) bacterial isolates were recovered from sampled fomites in the Accident and Emergency ward, while Children ward 13 (12.50%) recorded the least. The door handles 23% had the highest rate of microbial contamination while pillow case 5% and light-plug-ins 5% were the least contaminated (Figure 1). 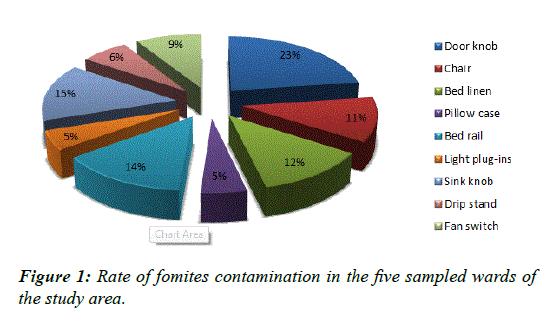 Figure 1: Rate of fomites contamination in the five sampled wards of the study area. Table 3 shows the total viable count of bacterial on fomites, door knob of the Female surgical ward had the highest count 9.6 × 106 cfu/ml while pillow case and bed linen shows insignificant count across some investigated ward. Table 3: Total viable count of bacterial isolates (cfu/ml) on fomites in the sampled wards. The majority of infections acquired within healthcare facilities are principally nosocomial and not auto-infections . Nosocomial infections create a major problem for health workers because it continues to hinder effective management of health care delivery in hospitals all over the world. Findings from this research work showed an average of 11.9% (Table 1) nosocomial infections rate was recorded in the investigated wards, which is higher than the World Health Organization established rate of 5 to 10% . The infections rate were greater than the rates reported from other part of Nigeria: Obafemi Awolowo University Teaching Hospital, Ife, 2.7%,  Lagos State University Teaching Hospital 3.6%  and 4.2% from hospitals in Ilorin . It is also greater than the prevalence rate of 2.6% in a tertiary health facility in Nigeria . The high average prevalence rate of nosocomial infections recorded in the retrospective study could be attributed to limitations such as lack of patient's data and recruitment criteria. Numerous microorganisms had been found to abound in hospital environment; contaminated surfaces have been reported to increase the prevalence of healthcare associated infections . The door knobs are the most contaminated of the surfaces sampled. The door knobs recorded and overall contamination rate of 24%. Staphylococcus epidermidis was found to contaminate chairs, Pseudomonas aeruginosa and Escherichia coli were found to be predominant on sink knob. The present of P. aeruginosa on sink knob could be attributed to its ability to grow in disinfectants, sinks, water and other materials in the hospitals . This might be due to the fact that P. aeruginosa; is mostly associated with to humid environments . Its might also be due to the fact that P. aeruginosa, is commonly found on the skin and in mucous membranes, and spreads through direct contact, thus surfaces become contaminated when carrier of this organisms come in contact with them . The contamination of the sink knob by microorganisms have been found to be as a result of water splash and settlement of dirt on the knob during hand washing, thus providing suitable substrates for microbial growth  reported that during hand washing activities in sink, drain contents splashed at least one meter from the sink and the polluted water carries microorganisms that cause infections in patients. Contamination of bed rails by Klebsiella pneumonia might be associated with endogenous source through patients’ secretion and faecal material. Compare to the more visible surfaces bed rails received little cleaning and disinfection activities. Aspergillus niger was isolated mostly from the door knob. Aspergillus flavus was predominant on chair while Furarium solani was isolated from bed linen. The isolation of fungi from bed linen may be due to improper drying which might aid spore germination. The traffic of people; health team and visitors, in the wards and their consequent contact with different patients, objects and surfaces also brings about environmental contamination . The distribution of microorganisms on fomites obtained in this work highlighted a major role of ward items as potential vehicles and reservoirs of nosocomial infections . Therefore, bacterial contamination of fomites reflects a regular daily risk of exposure to several hospitalacquired infections in case of contact with these contaminated surfaces. The contamination of these fomites could be attributed to irregular disinfection, the types of disinfectants used, unhygienic conditions, overcrowding and lack of surveillance and implementation of hospital acquired infections control protocols . The highest bacterial colony count 9.6 × 106 cfu/ ml was recorded on door knob with the least on pillow case. Despite the fact that this study is limited to a few sampled population, its establish the fact that Nosocomial infections still persist within our healthcare setting as reported in similar studies and fomites serve as reservoir for pathogenic microorganisms, which is evident in the isolation of diseases causing bacteria from fomites surfaces in this study, thus proves that fomites are possible vehicles of transmission of nosocomial infections within healthcare facilities. The Government and Hospital management board should provide adequate resources needed to mitigate cross infection between the animate and inanimate environment of our healthcare settings. My sincere appreciation to Mr. Olorunfemi Oluwaseun, the H.O.D of each sampled wards for their efforts during the course of samples collection. Barrie D, Hoffman PN, Wilson JA, et al. Contamination of hospital linen by Bacillus cereus. Epidemiol Infect 1994;113(2):297-306. Osterholm MT, Hederg CW, MacDonald K. Epidemiology of infectious diseases. In: Mandell, Douglas and Bennett’s principles and practice of infectious diseases. The Lancet Infectious Diseases. 2005;5(7):405-6. Nwankiti OO, Ndako JA, Nwankiti AJ, et al. Computer keyboard and mouse: Etiologic agents for microbial infections. 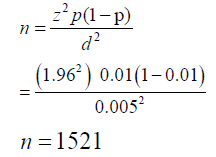 Nat Sci 2012;10(10):162-6. Boyce JM, Pittet D. Healthcare Infection Control Practices Advisory Committee; Recommendations of the Healthcare Infection Control Practices Advisory Committee and the HICPAC /SHEA /APIC/ IDSA Hand Hygiene Task Force. MMWR 2002; 51(RR 16):1-45. Umar D, Basheer B, Husain A, et al. Evaluation of bacterial contamination in a clinical environment. J Int Oral Health 2015;7(1):53-5. Uneke CJ, Ogbona A, Oyibo PG, et al. Bacteriological assessment of stethoscopes used by medical students in Nigeria; Implication for nosocomial infection control. Healthc Q 2009;12(3):132-7. Nazir A, Kadri SM. An overview of hospital acquired infections and the role of the microbiology laboratory. Int J Res in Med Sci 2014;2(1):21-7. Onipede AO, Oluyede CO, Aboderin AO. A survey of hospital acquired infections in Obafemi Awolowo University Teaching Hospital, Ile-Ife Afr J Clin Exp Microbiol 2004;5:108-18. Kesah CN, Egri-Okwaji MTC, Iroha EO, et al. Aerobic bacterial nosocomial infections in paediatric surgical patients at a tertiary health institution in Lagos, Nigeria. Niger Postgrad Med J 2004; 11:4-9. Odimayo MS, Nwabuisi C, Adegboro B. Hospital acquired Infections in Nigeria. Trop J Health Sci 2008;15:49-54. Ige OK, Adesanmi AA, Asuzu MC. Hospital-acquired infections in a Nigerian tertiary health facility: An audit of surveillance reports. Nigeria Med J 2011;52:239-43. Saka KH, Akanbi AA, Obasa TO, et al. Pathogenic aerobic bacterial contaminants on non-critical hospital surfaces within Paediatric Ward of a Nigerian Hospital. J Med Microbiol Diagn 2016;5(241):2161-703. Iduh UM, Chollom CS, Nuhu A, et al. Nosocomial infections in post-operative wounds due to Staphylococcus aureus and Pseudomonas aeruginosa in Benue State Nigeria. African J Microbiol Res 2014;9(36):1989-96. Petignat C, Francioli P, Nahimana N, et al. Exogenous source of Pseudomonas aeruginosa in an Intensive Care Unit patient: Implementation of infection control and follow-up with molecular typing. Infect Control Hosp Epidemiol 2006;27(9):953-7. Cordeiro AL, Oliveira MM, Fernandes J D, et al. Equipment contamination in Intensive care units. Acta Paul Enferm. 2015;28(2):160-5. Oliveira AC, Damasceno QS. Surfaces of the hospital environment as possible deposits of resistant bacteria: a review. Rev Esc Enferm USP 2010;44(4):1112-7. Well Y, Galuty M, Rudensky B, et al. Nursing and physician attire as possible source of nosocomial infections. Am J Infec Control 2011; 39(7):555-9. Gebremariam TT, Declaro MFF. Operating theatres as source of nosocomial pathogens: A systematic review. Saudi J Health Sci 2014; 3(1):5-8.